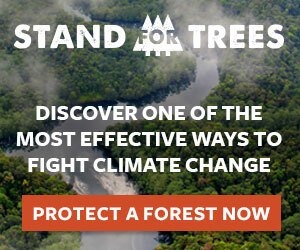 What if we all stood up for trees and saved a tonne? The term ‘tonne’ represents a metric ton – a unit of measurement equal to approximately 2,205 pounds or 1,000 kilograms. That’s a lot of CO2 that would otherwise be released into the air, contributing to the man-made greenhouse gases that are accumulating and accelerating climate change in our lifetimes. Purchasing Stand For Trees Certificates is one of the most effective actions an individual can take to halt deforestation and combat climate change.